One can waste a lot of time arguing with the oped page of the WSJ, but this piece by economist John Taylor seemed worth a brief response, as he’s going after an argument that has resonated with many in recent weeks: secular stagnation. I’ve talked about this for years under the rubric of slack labor markets, which have led to diminished bargaining power and stagnant real earnings for many in the workforce. It is also a contributor to increased inequality. Taylor argues, however, that secular stagnation is “hokem.” His argument rest on two points, both of which seem obviously wrong. First, he claims that the current recovery has been weak is not due to any underlying problems in the private sector or lousy fiscal policy, but due to “policy uncertainty, increased regulation, including through the Dodd Frank and Affordable Care Act.” But the recovery began in the second half of 2009, well before either of those measures took effect. And, in fact, since they’ve done so, if anything, growth and jobs have accelerated. Financial markets have done particularly well—I’d like to hear Mr. Taylor’s explanation of how “uncertainty” around Dodd-Frank explains the S&P’s 2013 performance. Taylor’s antipathy toward fiscal stimulus leads him to completely omit the fact of austerity in the form of fiscal drag as a factor in the weak recovery. The US budget deficit fell from 10% to 4%, 2009-2013, the largest four-year decline since 1950. Given Taylor’s views regarding deficits crowding out private investment, this trend is an inconvenient truth that in his model should have boosted growth. If you go back and study the economy prior to the crisis, there is something a little bit odd. Many people believe that monetary policy was too easy. Everybody agrees that there was a vast amount of imprudent lending going on [there’s Taylor’s “residential investment”—i.e., the housing bubble]. Almost everybody agrees that wealth, as it was experienced by households, was in excess of its reality. Too easy money, too much borrowing, too much wealth. Was there a great boom? Capacity utilization wasn’t under any great pressure; unemployment wasn’t under any remarkably low level; inflation was entirely quiescent, so somehow even a great bubble wasn’t enough to produce any excess in aggregate demand. Yes, there was a lot—too much—residential investment, but employment growth was terribly weak (up 20% in the prior two cycles, up 4% in the 2000s one); unemployment fell to 5% by the end of the 2000 recovery, but the share of the population employed actually declined. Real GDP grew almost a point more slowly per year over the 2000s business cycle relative to the prior two cycles. Business investment grew less than half as fast in the 2000s than it did in the 1990s. 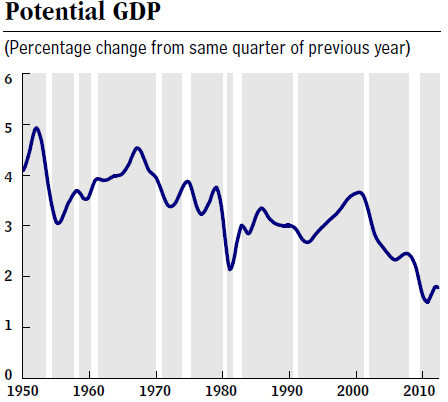 In fact, after rising pretty steeply in the 1990s, CBO’s estimate of potential GDP fell sharply in the 2000s (see figure below), a serious cost of the problem Summers is raising and Taylor is wrongly debunking. It’s also worth noting that middle-class incomes and poverty rates did much better in the 1990s, thanks to full employment conditions in the latter half of that cycle, than in the 2000s, when slack labor markets led to a flattening trend in real median income and increasing poverty rates. I doubt any of this will convince Taylor and others who simply want to go after the ACA, the Fed, stimulus measures, et al. But those of us interested in blazing the path back to full employment should recognize these arguments as politically motivated distractions. Share the post "Taylor v. Summers on Secular Stagnation"
10 comments in reply to "Taylor v. Summers on Secular Stagnation"
Can we simply suggest that any economist blogging must declare his/her belief in Say’s law somewhere on the page, or in the blog. I’ll figure out the filter on how to deal with those that do and this would usefully tag the majority of useless blogs. I do not believe Say’s law. “most economies don’t have financial assets”? that’s a truly bizarre comment. Is your irony detector broken? That’d be bizarre. Secular stagnation talk is dishonest. a) Postulating that it may inhibit or prevent recovery ignores or diminishes the overwhelming impact common sense measures would have in achieving a quicker route to a full or fuller economic potential. b) If an economist (which is no qualification for economic wisdom) speculates the 2000’s exhibited slower growth despite speculative booms, he might consider money invested in real estate (property and unneeded construction) probably were not the most productive uses of capital. Thus if Summers got his head out of his assets, he’d see the opposite effect. Tulip bulbs, irrational exuberance in tech stocks, mac mansions for all, can detract instead of adding to performance. But how anyone talks about the 2000’s without mentioning an extra 1% GDP spent in two endless wars, and 1% on tax cuts for the rich, and rising inequality, I don’t know. Then again, 82% of Bush tax cuts are permanent, which no one talks about. Remind me again who was supposed to be the not so smart chief executive? I’m currently dawdling my way through Beinhocker’s “The Origin of Wealth”*, and one of the wonderful points he makes is that back when Walras and Jevons were borrowing from the First Law of Thermodynamics in order to make economics more ‘science-y’ and ‘math-y’, they did not understand the Second Law of Thermodynamics, because it had not yet been discovered. The first Law of Thermodynamics assumes a closed system, and Walras and Jevons unwittingly incorporated this assumption into their economic models. Walras and Jevons assumed that ‘the economy’ was a closed system; this had the added benefit of simplifying their math. Classical, neoliberal economists – and Taylor appears to be in that group – are the intellectual descendants of Walras and Jevons. Economists like Taylor (and Laffer) appear to assume that economies are closed systems. If your economic ideas were shaped by neoclassical economists like Walras and Jevons, you would assume that the economy is a closed system. This intellectual framework would lead you to believe that ‘government spending crowds out investment’, because you assume that ‘the economy’ is a limited, finite entity. After Walras and Jevons tried to mold economics onto the framework of the First Law of Thermodynamics, the Second Law of Thermodynamics was discovered. The Second Law of Thermodynamics explores the implications of open systems – and our economy is definitely an open system: energy comes in, energy passes out. It self-organizes, creates novel solutions, and adapts. Nevertheless, a lot of new economic thinking is happening at this historical moment. New ideas are beginning to emerge, many of them on blogs, as well as in new business ventures. These new ideas draw from a range of disciplines, and are not hampered by the intellectual errors of Walras, Jevons, and 19th century physics. For this reason (as well as the fact that I agree with Larry Summers’ analysis), I suspect that Taylor is fighting a losing battle. He is engaging in the economic equivalent of crying ‘wolf!’ However, given the declining ratings for CNBC, many people are tired of hearing it. * “The Origin of Wealth: The Radical Remaking of Economics and What It Means for Business and Society”, Eric Beinhocker, c 2006, 2007 McKinsey & Co., Inc. Although I’m not sure how Potential GDP is calculated, it’s pretty clear looking at similar charts that the US economy has long been in decline. Look at yoy on personal consumption for instance. Secular stagnation is something you can see, as well.. No vibrant economy has as many dead cities and decaying downtowns as we do – not just Detroit, but pretty much any small town in any state as well as a large number of mid sized cities in the rustbelt. OK, will everyone please stop for a moment, inhale and accept the following observations. 1) Demographics: the annual growth rate in the working-eligible population has dwindled from 2%+ in the 1980-90s, to barely 0.25% in this decade. So to expect a booming GDP growth rate, is a stretch. 2) the economy has shifted to a service-sector dominant economy; the economic multipliers are not as evident as when manufacturing reigned. 4) the economy remains one of the most undertaxed of the OECD-30. This would be fine if the books were balanced, but not so good as there are continuous deficits which cost interest, and numerous wars that wer financed with little in return. So to debate the meaning of secular stagnation (which has spared all the abyss of economic depression) or the relationships of health sector, monetary and regulatory policies to GDP growth, while the above four gorillas in the room go unaddressed, is all the reason why economists have such a poor reputation for pragmatism and such a great reputation for their limited usage. Immigration and birth rates are declining because of the weak economy. I think you may be looking at cause not effect.